Overnight a Bell County Constable arrested a 29-year-old Temple man in connection with an Aug. 8 shooting near the Harris Community Center, 401 N. Alexander. 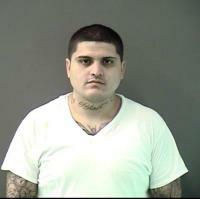 Eric Lee Anzaldua is charged with deadly conduct. The shooting occurred in front of the Harris Center at approximately 7:05 p.m. on Aug. 8. Belton police arrived at the scene within minutes but found no victim or suspect at the building. Police did a quick sweep of the area and found the victim around the corner from the Harris Center with a gunshot wound to the back. He was alert and speaking but refused to cooperate with authorities at the time. The shooting was not connected with any activities at the building, but the victim did briefly enter and seek help after he was shot.